With the same fineness and superb obverse and reverse details as the 1 oz coin, the 1/2 oz 2019 Krugerrand is a smart buy for those who want a more affordable option. Each coin is meticulously struck in 916.7/1000 (22 carat) gold and finished to the highest standards. Add this popular version of the world's first and most successful gold bullion coin to your basket now at coininvest.com. Since they first appeared on the market back in 1967, gold 1 oz Krugerrand coins have enjoyed immense success. Conceived as a way to market South African gold, their popularity soared and prompted other countries such as Canada, the US, China, Australia and the U.K. to launch their own gold bullion coin programmes. Building on the coin's success, the Rand Refinery introduced three fractional coins, ½ oz, ¼ oz and 1/10 oz, in 1980. 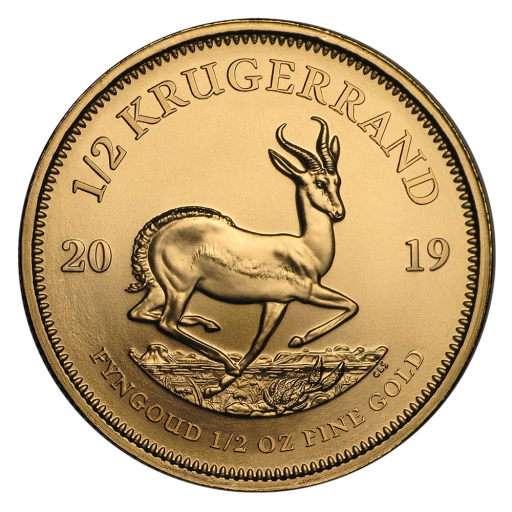 Why choose the 2019 1/2 oz South African gold Krugerrand? Each coin contains a full half ounce of 916.7 gold. As well as being an investment that will retain its value through turbulent times, the 2019 ½ oz Krugerrand makes a thoughtful gift for new collectors or loved ones. These gleaming gold coins can sell quickly so be sure to order your 2019 ½ oz Gold Krugerrand coins with couninvest.com today. Don’t forget to check out our extensive collection of gold and silver Krugerrand coins from previous years.